Despite being an average and peaceful Japanese town, Morioh has recently become a hotbed of bizarre happenings. Within this town resides Josuke Higashikata, a high schooler with a mysterious power that even he doesn’t know the origin of, with the ability to restore items and people back to their original shape after being damaged. Everything changes, however, once Josuke meets Jotaro Kujou, his biological uncle, who tells him all about his cursed bloodline, the history of the Joestar Family, and their supernatural powers known as Stands. Soon after, Josuke discovers that someone within his hometown is granting others similar powers, and sets off on an adventure, alongside Jotaro and his friend Koichi, in order to uncover the threat. Whilst live action adaptations of anime and manga franchises in the west are almost unanimously received poorly, over in their home country of Japan, they tend to fare quite a bit better. Sure, not all of them are successes, such as the entirely baffling Black Butler movie that shifted the setting from 19th century London to the year 2020, but there are definitely more hits than misses. Helmed by the legendary cult filmmaker Takashi Miike, himself no stranger to adaptions after tackling the Yatterman and Terra Formars films, the first attempt to bring the Joestar family into Live Action was looking promising, but ends up falling just a little short, albeit more due to what slice of JoJo’s Bizarre Adventure they chose to adapt rather than anything that ends up on screen. Anyone who is a fan of JoJo will be able to see the glaring issue almost immediately, but for those who don’t know, the manga and anime are split into numbered parts, to signify a change of the main character to the next in the bloodline. If you were making a new live action series of films, you might think the sensible place to start would be, well, the beginning, but in a head-scratching decision, Diamond is Unbreakable is actually the fourth part of the series. I can totally see the justification for starting here; each part is relatively self-contained, and as such doesn’t need the previous volumes to function, and Diamond is Unbreakable is the first to feature a fully Japanese cast in a Japanese setting, which almost certainly makes things easier on what is likely a tight budget. I could probably forgive it for all these things, but the most damning detail of all in adapting Part 4 in particular is in the structure and length of the source material. Whilst Phantom Blood and Battle Tendency are serialised, telling an ongoing story from week to week, from the third part, Stardust Crusaders, onwards it leans more towards episodic storytelling, focusing on a new enemy stand user every week, whilst slowly working towards a larger goal in the background. This is fine for a manga or a TV show, but it does not translate well into a movie format, and this really shows in the final product. The movie essentially has two climaxes, one in the middle and one at the end, and I was quite shocked after seeing what I assumed to be the end of the film, that I still had another hour to go. It certainly makes for a weirdly paced film, and made it feel far longer than it actually was. Another issue, as previously mentioned, is the length of the Diamond is Unbreakable manga. It is far from the longest in the series, but at 174 chapters, it certainly isn’t the shortest either. This film covers roughly the first 17 chapters, meaning a full adaptation would need a good ten films to get through! Obviously, things would be cut, but even getting down just to the core of the story, it would need five or six films, which doesn’t seem feasible to me. It would make a lot more sense to adapt Phantom Blood into a film, not only because it’s the start of the franchise, and structured more like a movie, but also because it’s a mere 44 chapters in comparison. When you put aside the baffling choice of what they chose to adapt and look at the film itself, it’s actually a pretty solid adaptation, sticking very close to the source material for the most part. There are a few extra scenes added in that weren’t in the original or the anime, but they’re few and far between, and are generally decent, such as the opening. The sole issue here is that the start of the manga it’s adapting isn’t exactly the most interesting bit, with the real meat of Diamond is Unbreakable not happening until a little later, with the introduction of the main antagonist Kira, who is simply teased here. It’s essentially two hours of character set-up for the sequels, and with the subtitle ‘Chapter 1’ at the start, that definitely indicates their intent. Whilst it wasn’t exactly the fault of the movie itself, JoJo was a notable box office flop in Japan, and now over a year after it was released in cinemas, there hasn’t been a peep from anyone about a follow-up entering production. So, with that, all you’re left with is two hours of set-up to a sequel that will likely never come to fruition, which makes it very hard to recommend now. A notable omission in the transition from page to screen is JoJo’s distinctive style. Love it or hate it, JoJo is one of the most artistically recognizable franchises on page and screen, and even with a talented filmmaker such as Miike in the director’s chair, it would just be impossible to do justice to in live action. I’d consider this a substantial loss, but one that is unavoidable. Still, I’d be lying if I said the lack of flair didn’t take away from my enjoyment of this interpretation when compared to the anime. If there is one front I can’t really fault the movie on, it would certainly be its cast, as pretty much every actor absolutely nails the characterisation from the source perfectly. Yuske Iseya’s Jotaro and Nana Komatsu’s Yukako in particular stand out to me as being absolutely spot-on, especially Komatsu, who walks the fine line between cute and creepy with ease. The only questionable performance would be Ryunosuke Kamiki as Koichi, who takes every opportunity to overact and chew the scenery. Honestly, this kind of over-the-top performance would seem ideal for a JoJo film, given how much the franchise usually leans into that, but this adaptation is relatively understated in comparison to its source, and no one else is acting in the same way, making him really stick out in a way that’s very distracting. 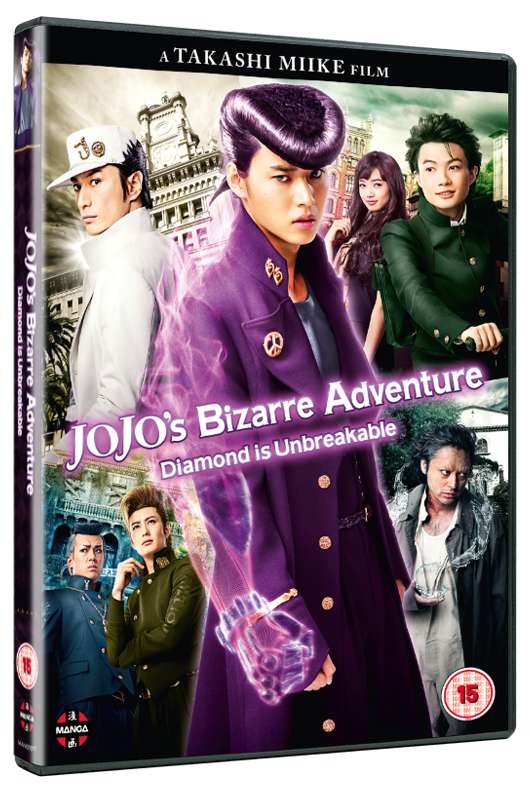 CGI in Japanese films is very rarely a strong suit, and JoJo’s Bizarre Adventure: Diamond is Unbreakable is no exception, looking very subpar when compared to Western blockbusters. That being said, the special effects artists who worked on the movie seem to be aware of this and use CG rather fleetingly, giving glimpses of stands as they’re rendered translucent or hidden by quick cuts. It’s honestly quite smart, as if they put them in the forefront, they’d just look silly, but they’re cleverly hidden to make up for the lacklustre effects. Long-time Takashi Miike collaborator Koji Endo once again returns to bring us the original score for Diamond is Unbreakable, which is solid. There are a couple of stand-out tracks here and there, but the majority isn’t really memorable. I might be slightly biased, as I do adore the soundtrack for the anime, and it doesn’t come close to that. It’s a shame they couldn’t have used some of Yugo Kanno’s anime score here to complement the original music by Endo. The lone bonus feature on this release by Manga UK is a theatrical trailer, but that isn’t the biggest disappointment with this release. No, that would be the fact that this film made in 2017 is getting released on DVD only. I realise that Manga’s hands were likely tied in this regard, but it’s still sad to see, as I really don’t believe that anything with an HD source should be relegated to DVD. JoJo’s Bizarre Adventure: Diamond is Unbreakable is about as good as an adaptation as could be made of this particular section of JoJo, but the decision to adapt Part 4, as well as any hopes for a sequel being slim, make this tough to recommend.